I love holidays because they're the perfect opportunity to work on fun craft projects! With Halloween fast approaching, I decided to put together a super simple (but super cute!) 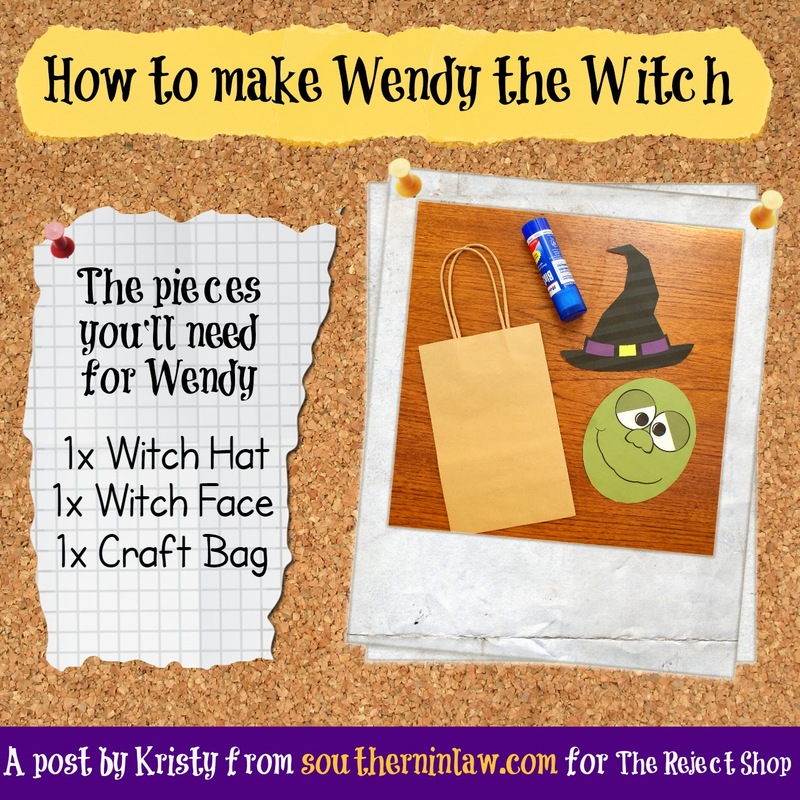 Halloween Craft Project to share with you all! Every year on Halloween we have loaaads of little trick or treaters arrive at our house with their pumpkin buckets or paper bags ready to load up with treats - but this year I decided the old loot bag needed a bit of a face lift. Everyone spends so much time on their costumes - so why not have a super awesome bag to match! 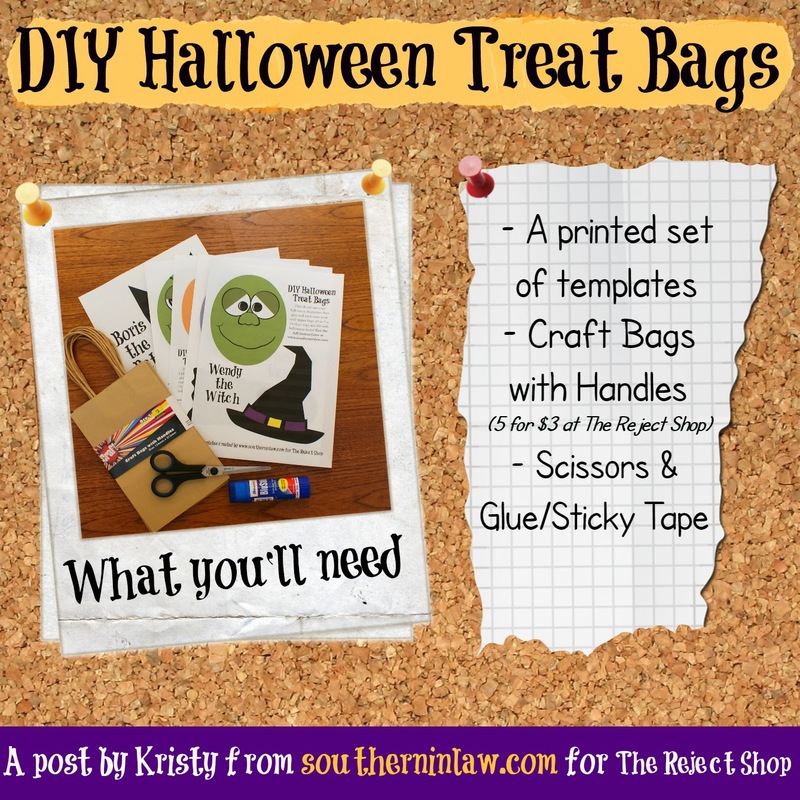 These Halloween Treat Bags also make the perfect gift bags or party favours as you can fill them with whatever you fancy - and I'm giving you all of the templates for freeeee! How's that for a Halloween treat?! We teamed up with our friends at The Reject Shop with this project because I wanted to make sure it was super affordable! Most of the items you need you'll probably already at home, so the only expenses are the cost of the paper and ink to print the templates (which you probably already have!) and the cost of the bags - which are super cheap at just $3 for a pack of 5 at The Reject Shop! 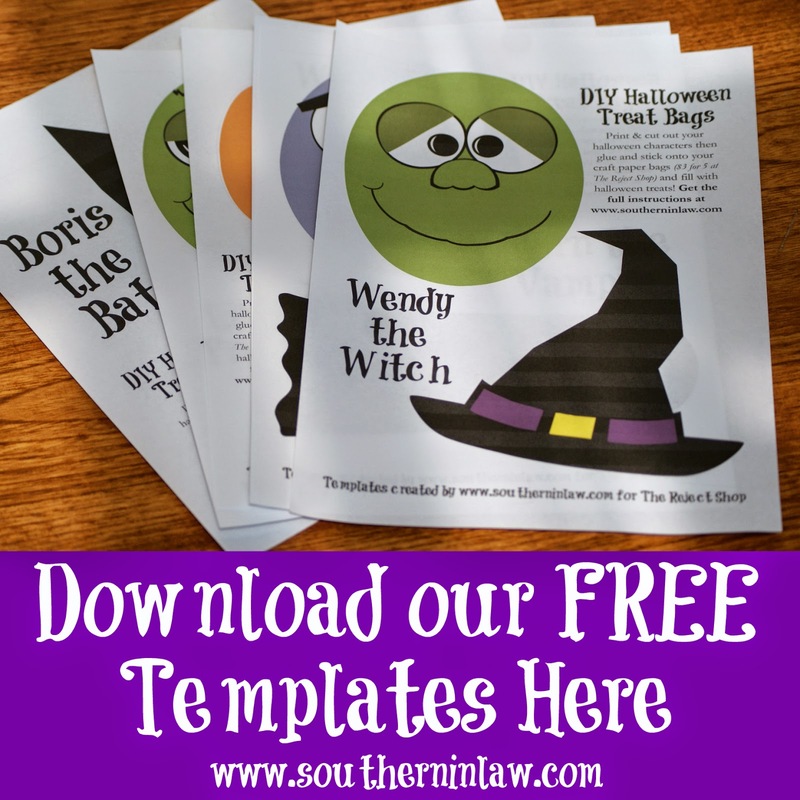 The first template you'll find in your set is Wendy the Witch! She is super simple to put together with just two pieces that you need to cut out and stick on. Be sure to stick her hat just at the top of the bag so that you have the top half of her hat sticking out of the top. 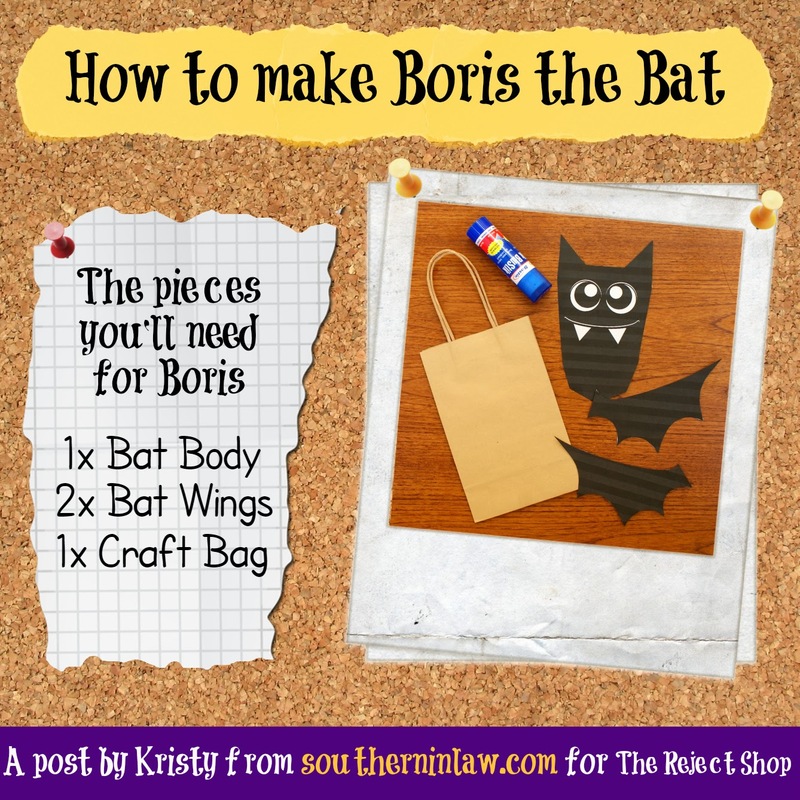 Boris requires three pieces and the sticking is a little bit different to Wendy as you want his wings to flap out on the sides! 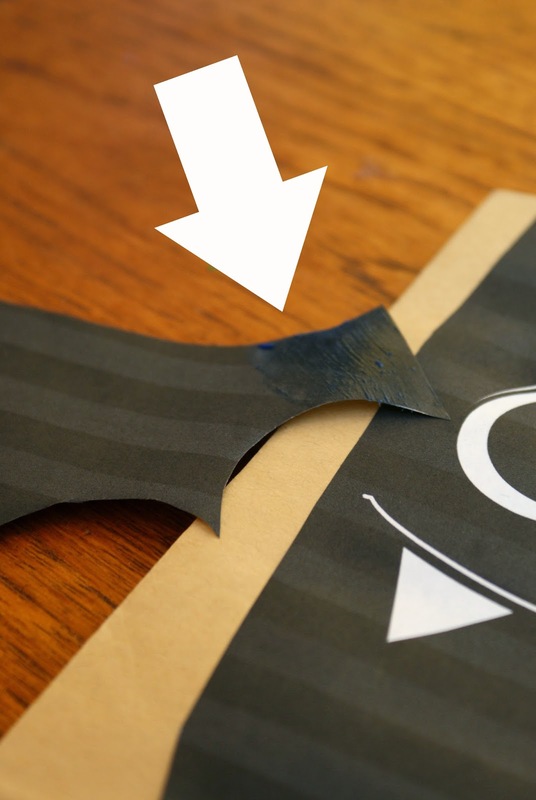 TIP: Whilst you can simply print Boris out on paper and stick him on as is, I recommend cutting out some cardboard or using two paddlepop sticks on his wings if you're not using the bags right away as the paper will curl slightly. Vern is really simple as all of his pieces are stuck directly onto the craft bag. 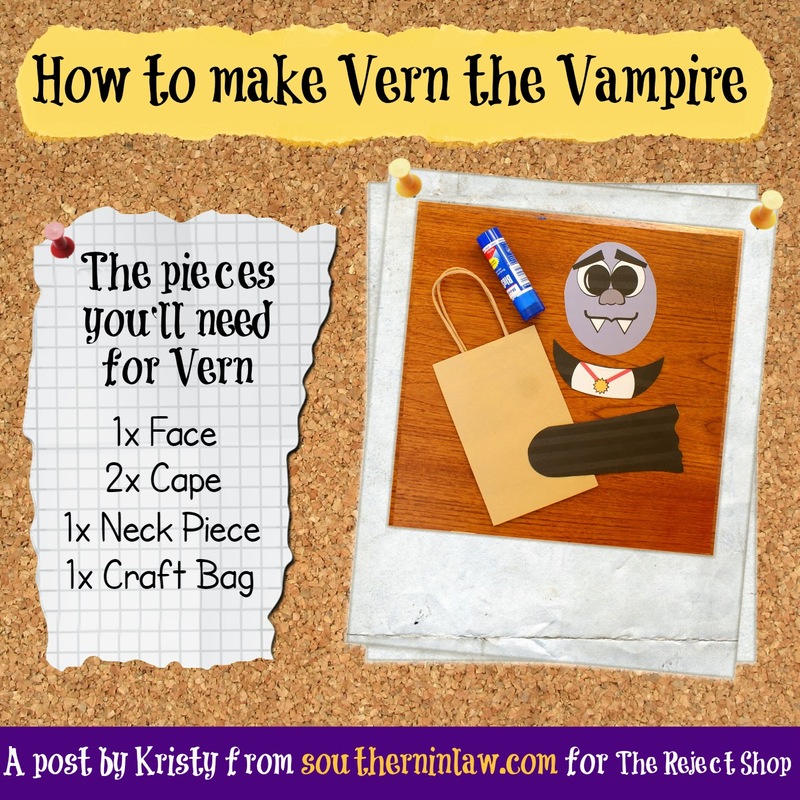 You'll need three pieces to make your Vern the Vampire Bag - his face, neck piece & cape (on the same page as Boris the Bat's Wings). Simply stick Vern's Face and Neck Piece onto the front of your bag and stick his cape onto the back. The choice is yours whether you'd like to stick his cape down fully or only attach a section at the top so that the bottom can flap. Next up is Little Frankie Frankenstein. Frankie needs three pieces and his bolts are glued on the same way as Boris the Bat's wings. 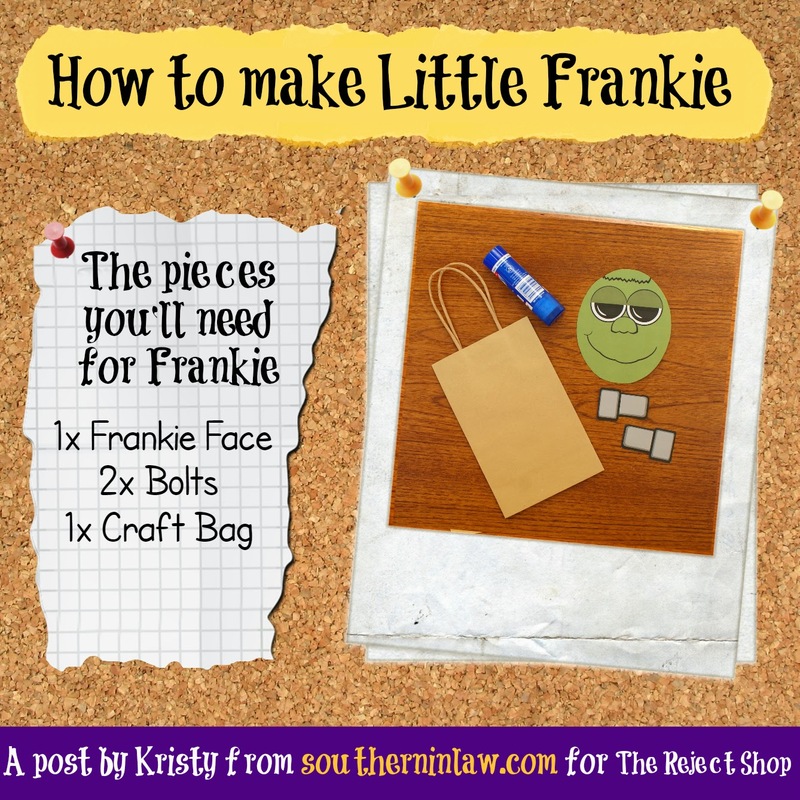 All you have to do for Frankie his face directly onto the paper bag, then stick his bolts on either side of the bag with the larger parts on the outside! 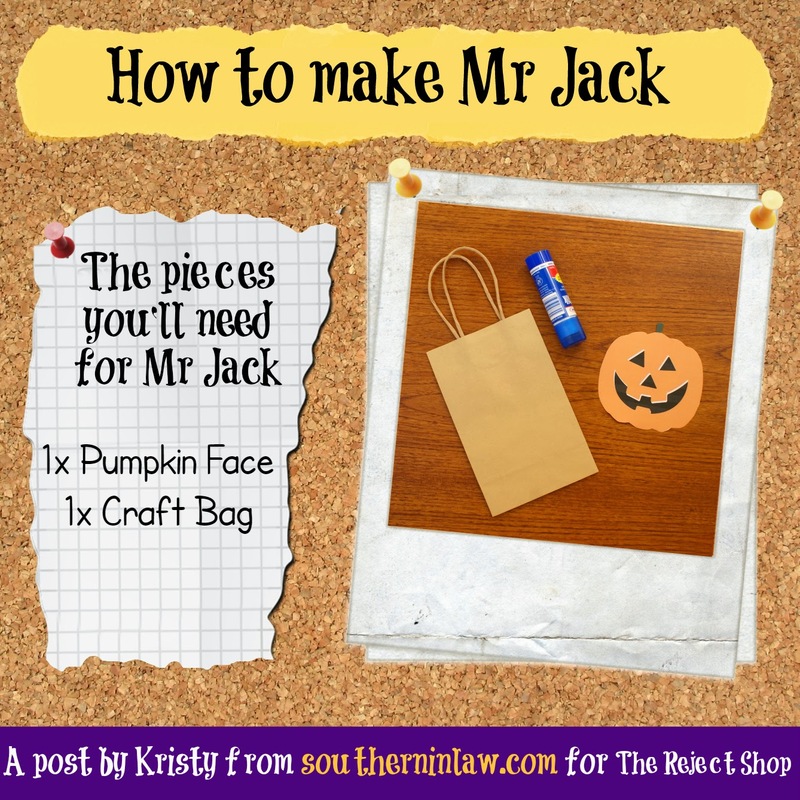 Mr Jack is perhaps the easiest of them all! Requiring just one piece - or two, if you'd like a face on each side! In the template you'll find two faces so you can either make two bags or one bag with two faces. Feel free to decorate however you like - add a bow to make this a Miss Jackie bag or personalise it however you like. 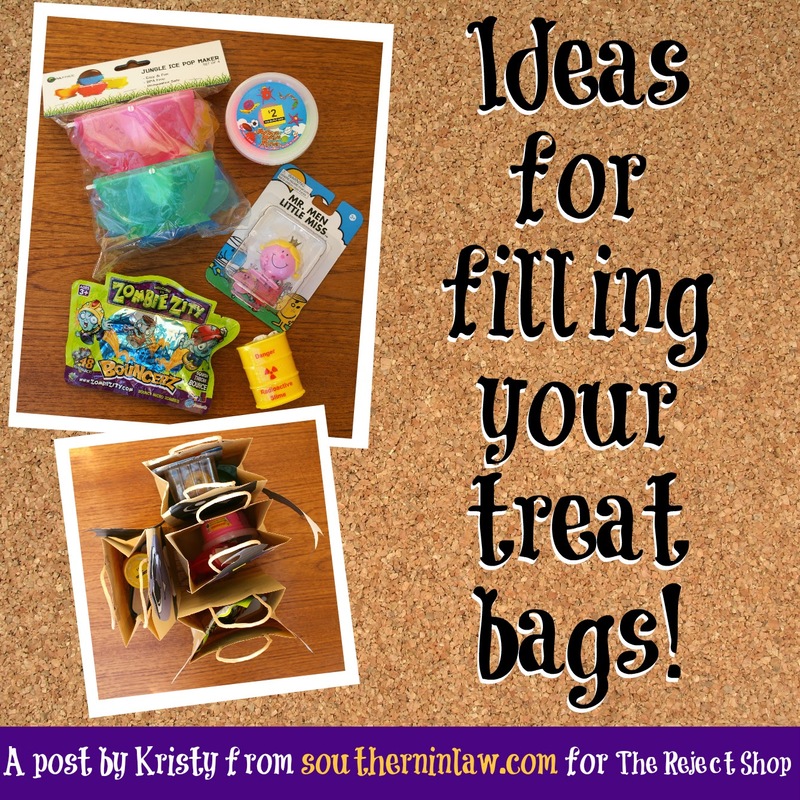 Now your treat bags are all done, it's time to fill them! 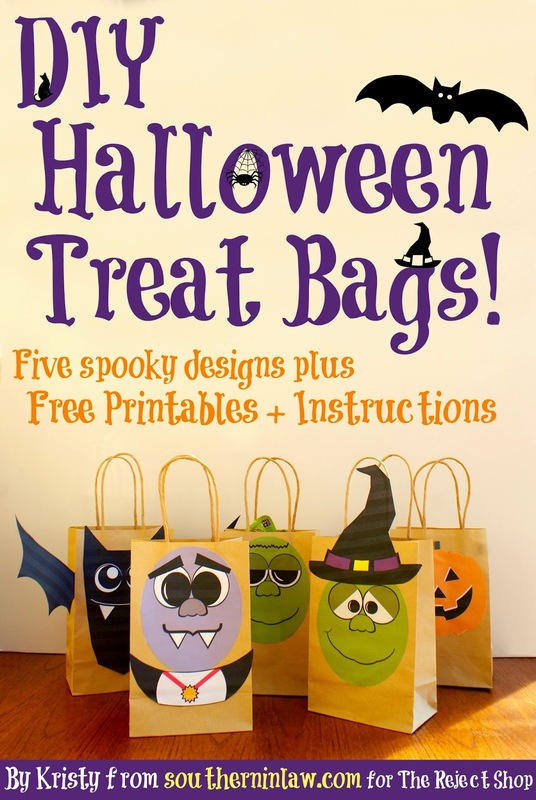 If you're using these bags as party favours or gift bags, here are some ideas for filling them! Instead of lollies or candy, why not add in something even more delicious? Things like homemade cookies or brownies are perfect - why not try our Healthy Chocolate Chip Cookies, Secretly Skinny Peanut Butter Chocolate Chip Cookies (just be wary of peanut allergies! ), Healthier Nutella Chocolate Chip Cookies or our Healthy Gingerbread Cookie Recipe cut out in Halloween shapes! Raw bites would also make the perfect healthy treat! The Reject Shop have lots of little toys under $5. As well as looking in the toys section - take a look at the party favours in the party section where you'll find things like pirate telescopes (4 for $2), leap frogs ($2 for a multipack), mini water guns ($2 for a pack of 6) and other bargain buys. In the toy section we found Zombie Zities (perfect for Halloween and just $2 a pack! ), radioactive slime (which Jesse is obsessed with and it's only $2), bouncy moulding clay ($2 each) and little toys like the Little Miss and Mr wind up toys (also $2 each). Kids loveee stickers and The Reject Shop have plenty of sticker options - full sized sticker sheets and books are $1-2 each and can easily be broken up or given as a single gift and there are also multipack value packs with 9 sheets of stickers for just $2! Take a look around the toys and craft sections for things like novelty erasers ($2 for a pack of 12), fun pens ($2 for a pack of 4) and things that kids can use again and again. Halloween is in Spring in Australia and that means the weather is heating up! We thought the Jungle Pop Ice Pop Makers were the perfect gift and at just $3 for a pack of four they're super affordable too! The possibilities are endless - so get creative! And share your ideas with us as well! But tell me, have you ever been trick or treating? What's your favourite treat? Whether trick or treating or not! This was a sponsored post for The Reject Shop. All opinions expressed in this post and the DIY How-To are completely our own and have not been influenced by the company in any way. If you're interested in working with Southern In-Law on a sponsored post, please contact us at southerninlaw@gmail.com for more information. There are so many cute halloween costumes for kids - so no wonder why you're looking forward to bringing him trick or treating!